The menu at L’Atelier is very much designed for sharing, and so we shared a variety of dishes, starting with a soft poached egg with white truffle (£49). A beautifully cooked egg sat inside a brilliantly crispy kadaif pastry, and when you cut into it, it revealed a runny egg with a vibrant yellow yolk. 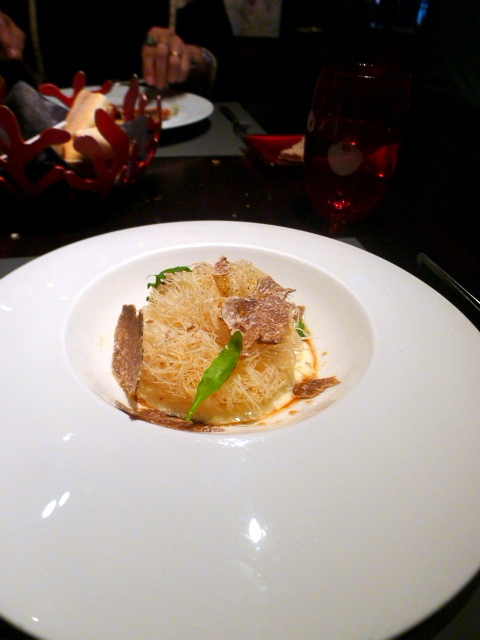 The combination of the light crunchiness of the pastry with the softness of the egg made for a delightful combination, especially with the intoxicating aroma of the truffle. 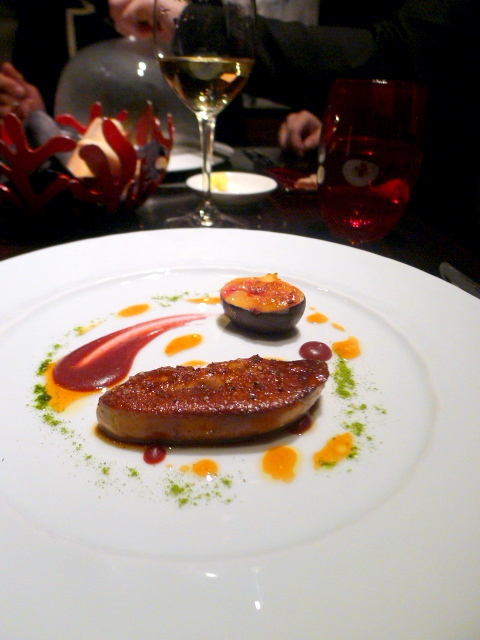 Pan seared duck foie gras oozed with the lovely fatty richness that makes this such a great thing of beauty. It was perfectly cooked, and alongside the foie gras was some caramelised fig which worked wonderfully with the foie gras. Roasted Scottish lobster (£49) was sweet with a firm texture, and accompanied by some young spinach leaves, peppers, a pepper sauce and an aromatic bay leaf cream emulsion, both of which provided an interesting contrast to the lobster. This was a really nice dish, although the spinach itself, cooked with a wasabi dressing, was a little peppery. 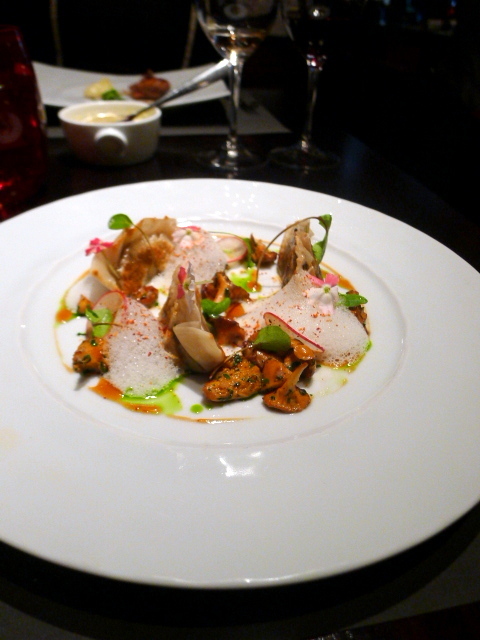 We enjoyed the gyoza of braised veal shank with harissa (£21) as it was a pleasant dish. The filling of veal shank was tender and tasty, and the use of harissa provided a touch of spice to the gyoza. Also on the plate were some beautifully cooked mushrooms, sweet tomatoes and some rich teriyaki sauce that brought all the flavours of the plate together nicely. 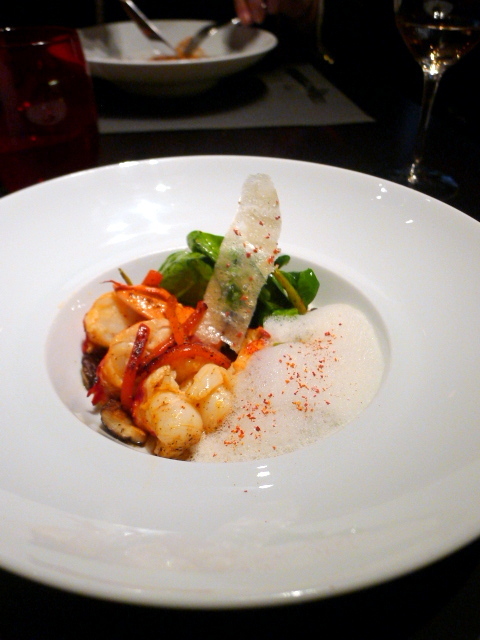 It was a really nice plate of food, but conceptually this dish didn’t quite have the sophistication as the other dishes. For me, this was just gyoza. 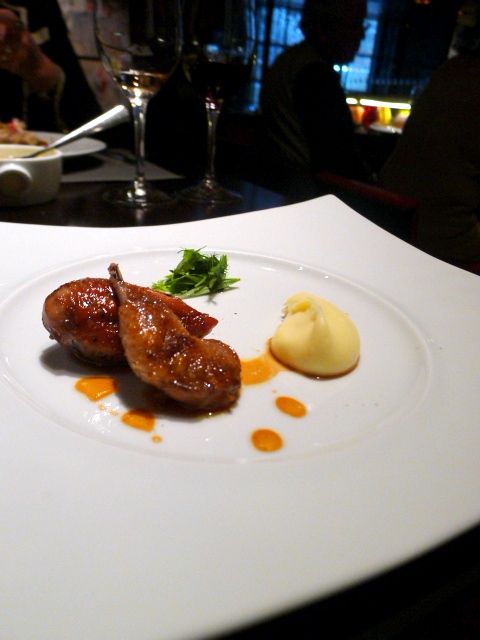 Free range quail stuffed with foie gras (£34) and served with mashed potatoes was a delight to eat. The quail was beautifully cooked and wonderfully tasty with a velvety smooth foie gras stuffing and a soy honey glaze. The creamy, buttery mash is an L’Atelier signature and was a little taste of heaven. It was a beautiful plate of food that included a small fresh herb salad garnish. 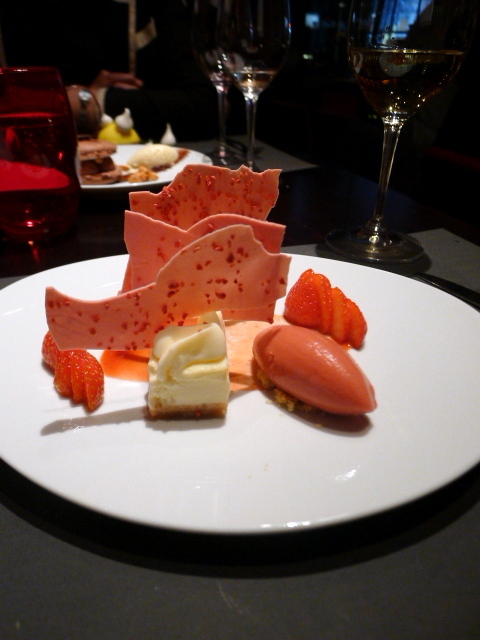 All the desserts were extremely well executed, prettily presented and delicious to eat. 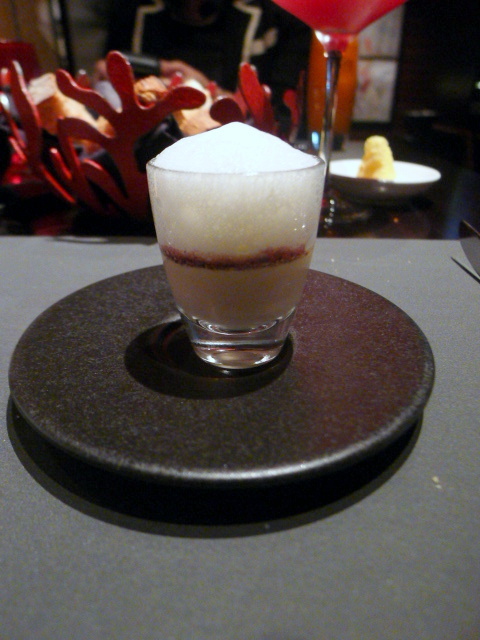 A strawberry mousse (£12) was lovely and accompanied by a light and zingy lemon sorbet and fresh strawberries. 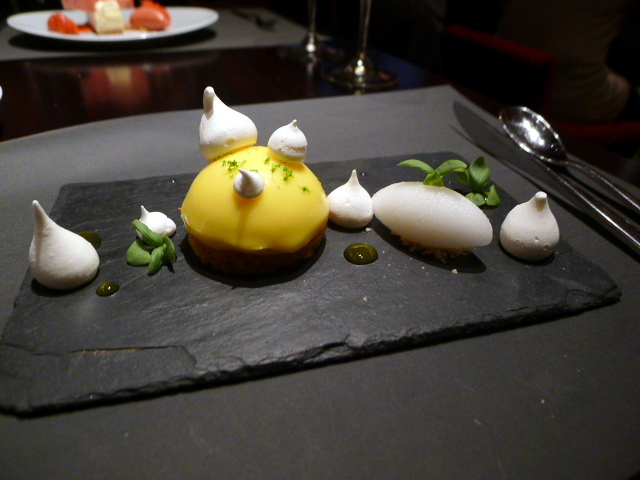 A lemon tart (£12) was zingy and nicely tart. It sat perched on a very thick (perhaps too thick) buttery biscuit base and was served with some lovely pieces of meringue. 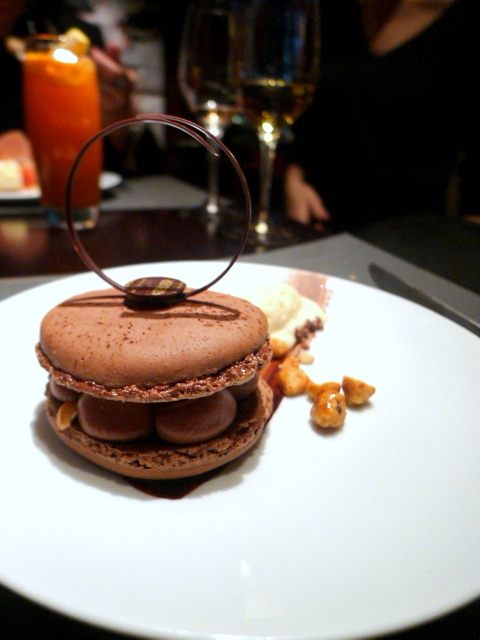 Finally a beautifully made chocolate macaroon (£12) filled with thick chocolate ganache was good and decadent and rich. It is virtually impossible not to enjoy a meal at L’Atelier. Time and time again they produce exquisite dishes that sing with finesse, elegance and a refined touch. The presentation is beautifully done, the staff are knowledgeable and attentive, and every time you go you can be assured of a fantastic fine dining experience. Lunch and pre-theatre menus range from £31 to £41. Three courses from the a la carte menu range from £56 to £122 (excluding the caviar). The truffle tasting menu is £230. Small tasting plates range from £19 to £49. There is also a bar menu. Prices excludes drinks and service.